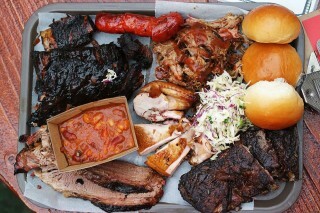 As an American who most recently spent a few years living in Austin, Texas, I feel like I know barbecue. I’m also the kind of person who, were it up to me, would survive on various kinds of slow-roasted meat and maybe a bit of white bread until I died of malnutrition, so I’m delighted by the barbecue fever that has been sweeping Melbourne lately. 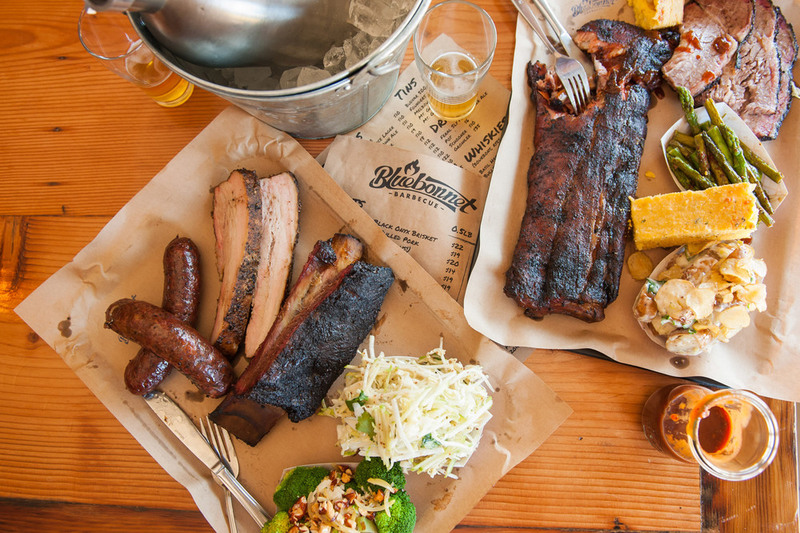 These days, there are more “Texas-style” barbecue restaurants clogging the arteries of this city than you can shake a rib at, but we’ve rounded up the best and separated the over-rated from the those worth every last meaty, juicy drop of hype. 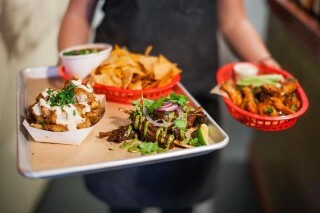 The motto at Smokin’ Barry’s, Melbourne-based food truck and catering service, is “you don’t need teeth to eat our meat”. Incredibly, that’s probably true. Here, the brisket, pork belly and ribs are hickory-smoked at low temperature for up to 16 hours until the meat is so tender, it falls right off the bone if you so much as look at it. Unlike many other American-style barbecue joints this side of the world, Smokin’ Barry’s makes use of the Kansas City style of cooking by both dry-rubbing the meat with a special blend of spices before smoking as well as “mopping” it periodically with sauce. Come here for the outrageously juicy pulled pork rolls, and stay for the impressive array of mouthwatering soul food side-dishes. 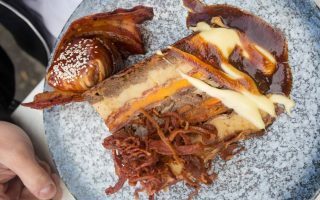 Head chef Chris Terlikar has a Michelin-starred pedigree, having earned his stripes at PUBLIC in New York City, so it’s not exactly a surprise that he has brought technical finesse and single-minded zeal to his latest venture, Collingwood’s Bluebonnet BBQ. Housed in an 1886 heritage-listed building on Johnston Street, Bluebonnet’s 3.8 metre, custom-built smoker churns out meat that is smoked for 18 hours, spiced to perfection, singed on the outside and fatty on the inside. Specialties like beef cheek (barbacoa) share a menu with somewhat less conventional barbecue fare, like the vegan smoked green jackfruit, and a lighter take on traditional southern sides. 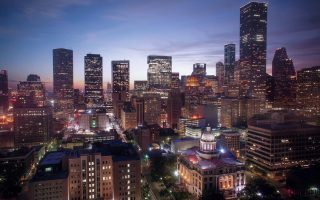 The venue’s bare brick walls and big backyard strung with fairy lights, are perfect for kicking back with a bourbon and imagining that you’re deep in the heart of Texas. 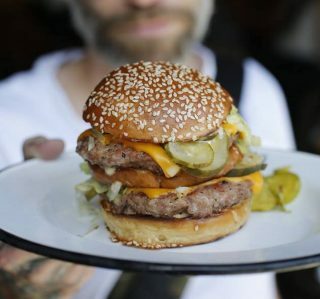 As if that weren’t enough, Bluebonnet will also be serving up the goods at the John Curtin Hotel, where their pop-up residency recently opened. With a name like that, you know Meatmother isn’t messing around. And if you want to get your greasy mitts on their 12 hour oak-smoked pork, brisket and ribs, you’d better make reservations, because they do sell out. Classic, no-frills side dishes like Texas toast, pickles, slaw and beans keep the focus where it belongs – on the meat: Wagyu brisket, hot links, flank steak and pulled pork, for starters. And just in case you forget what it’s all about, there are…carnivorously-themed paintings adorning the walls. Meatmother also raises the stakes (or should I say, steaks? #notsorry) by incorporating that every-hyped culinary staple, bacon, into as many dishes as possible. Start your evening in the downstairs bar of the Swan Street location with Meatmother’s signature cocktail, the Bacon Sour (exactly what it sounds like), before moving your way upstair to the dining room to begin the carnage. 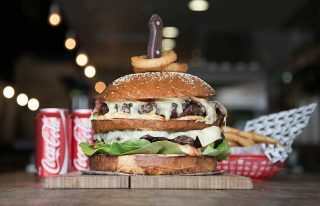 With two locations in Port Melbourne and Prahran, Smokey’s is a little more family-friendly and straight-up than other ultra-hip Melbourne barbecue joints. The walls are decorated with American flags and license plates, a wagon-wheel chandelier hangs from the dining room ceiling, and the food is somehow both simple and sinfully decadent. Smokey’s speciality is, of course, straight-shootin’, good ol’ Texas-style barbecue that will absolutely melt in your mouth, but they serve up other regional classics too, like chilli dogs, BLTs, Philly cheesesteaks and reubens. Let’s just say, this place is as American as God, guns, baseball and apple pie on the fourth of July. USA! USA!